About 60 percent of the 781 respondents in a recent survey indicated that they oppose a proposed 10-story senior living complex at 4747 W. Irving Park Road in the Six Corners commercial district, although the project has earned the endorsement of two local groups. In addition, about 28 percent of the respondents indicated that they support the overall project, while 12 percent said that their support came "with reservations." The survey was conducted by the Six Corners Chamber of Commerce and was available for respondents to fill out online or at several area stores on the Northwest Side. About 62 percent of the respondents were between age 35 and 54. Alderman John Arena (45th), or his chief of staff Owen Brugh did not respond to requests for comment. Arena has said in the past that the project would be a catalyst for additional economic development in the area. The chamber, which was formed last year, plans to review the results and send a summary and recommendations for the site’s redevelopment to city officials. Chamber member Joe Angelastri said that the city should re-examine the Six Corners Master Plan, which was approved in 2013, and come up with a comprehensive strategy for several large development sites in the area, including the site of the proposed senior living building and the former Sears site at 4730 W. Irving Park Road. "I think there should be a re-examination (given) the market conditions are not the same from 5 years ago," Angelastri said. Both the Six Corners Association and the Old Irving Park Association have endorsed the project, while the Portage Park Neighborhood Association is not taking a stance on the proposal. "We think on balance it’s a strong proposal," said Six Corners Association president Marc Sussman. "We also think it’s going to bring residents with money to the area and lots of workers." About 64 percent of the survey’s respondents said that they disliked the project’s height, and 56 percent said that they had concerns about the projected monthly rents, starting at $4,400 a month for the independent living units, $6,000 for the assisted living units and $7,200 for the memory care apartments. In addition, an Aldi’s grocery store would be one of the commercial ground-floor tenants in the complex. A one-story retail center with rooftop parking had been planned for the site, but the property’s owner, Clark Street Real Estate, later dropped those plans and teamed up with Ryan Companies to the build the planned 265 senior apartments, most of which would be for assisted living. The total number of parking spaces for the apartments and stores would be 237 and access to the parking would be from Kilpatrick Avenue. Meanwhile, the public plaza component of the $120 million project received the highest marks in the survey, with 69 percent liking that element. The planned mix of retail and residential uses also received high marks, with 45 percent of approval. 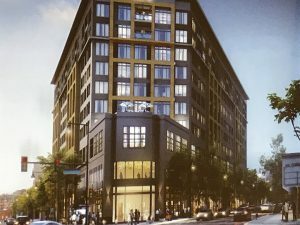 In a July 18 letter to Arena, the Irving Park association’s board of directors said that the design building and its 10-story height would be a good fit for the irregularly shaped lot. "We understand that the development has incorporated many elements of the area’s master plan but exceeds the number of recommended stories. It does, however, create the desired residential density, albeit in a different configuration. The proposed designs address the height issue by creating a setback at the Milwaukee/Irving Park intersection, minimizing its visual impact," the letter states. Arena has said that the net height of the project is in line with the master plan’s recommendation of four or five stories for the site since a portion of the project would be only one-story tall. He also has said that the redevelopment of other nearby large parcels, including the former Sears site, would be less than10 stories. Sussman said that the proposal conforms with many of the pedestrian-friendly recommendations in the master plan, including walkways connecting Milwaukee Avenue and Irving Park Road, and that the storefronts would have large windows, enhancing the curb appeal of the shopping area. Some survey respondents expressed concern that the site, which is located in the heart of Six Corners, may be better suited for market-rate housing for all ages. Sussman said that senior living complexes are an essential component of any community and that there will be several other opportunities in the business district to build developments which cater to working professionals. "We don’t have to hit a home run now. … We just need to keep moving forward," he said. Meanwhile, about 12 percent of the respondents said that they would like to see on-site affordable housing for low-income seniors. Under the proposal, there would be no on-site, low-income units for seniors, but the development team plans to comply with city affordable housing requirements by constructing nine affordable apartments at off-site locations within 2 miles of the 10-story building. The former convent at Saint Cornelius Church, 5430 W. Foster Ave., is one of the locations being considered for the low-income units for seniors.